What they do: Cook Play Live creates healthier and more engaged individuals in urban areas. They are an organization that helps ​public school students and their parents ​understand and adopt healthier lifestyles. How they do it: Cook Play Live instills practical life skills that establish healthier eating practices, improve shopping choices, and reinforce community bonds through the joy of cooking. They partner with local stakeholders to end malnutrition by increasing the demand for and availability of affordable fresh produce in low-income urban communities. They educate on nutrition and have interactive cooking classes that reflect NYC’s ethnic and cultural diversity. During these lessons, they make nutritious, tasty, and affordable meals. Cook Play Live uses games and activities to reinforce teaching points and provide tips and tools to eat healthier and affordably on the go. Latest project/campaign: Their latest project is bringing the ​Cook Play Live program to New Settlement Apartments at PS 64 throughout the academic year, and hopefully year-round. Major Funding: Individual donors and program revenues. Interesting fact about how they are working to positively affect the food system: Since its inception in 2015, Cook Play Live has delivered cooking and nutrition workshops to more than 3,400 children and parents; approximately 2,000 through their train-the-trainer healthy eating program in collaboration with other after-school programs. 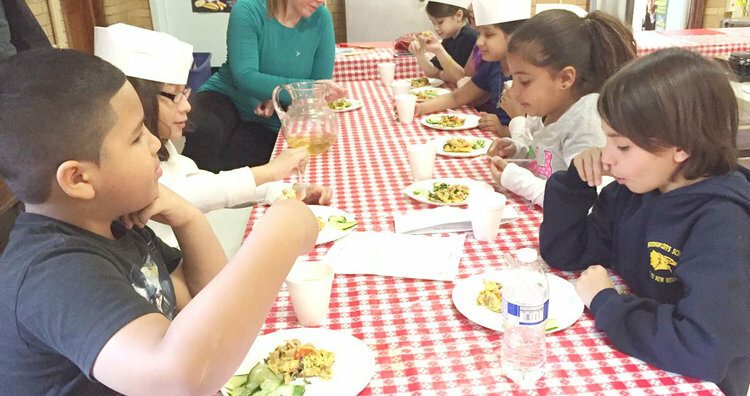 Their programs help New Yorkers across the boroughs make healthier eating choices daily. Introduce the basics of nutrition including how to read nutrition labels, understand portion size, grocery shop on a budget, and more. Teach cooking and mindful eating using healthful methods, ingredients, and food substitutions. Use Healthy Habit Challenges to encourage students to integrate nutrition awareness into everyday life. Prepare students to live healthier lives and carry new knowledge into their futures.